16 GB model Galaxy Note to return with the Galaxy Note 4? If you follow religiously whatever comes off the mobile tech press then you pretty much are familiar with all the rumours and leaks flying left, right and center about Samsung’s upcoming Galaxy Note 4. While most of these are just mere speculations triggered by the need to be ahead of the pack and what not, there’s a lot of credible rumours (well in mobile tech news rumours can be credible, its science!) as far as the Galaxy Note 4 is concerned. So solid that I can’t ignore them anymore. This one caught my eye: It is an image from serial leaker @evleaks as you can already tell. The current Galaxy Note device from Samsung was unveiled in just one storage option: 32 GB. There was no 16 GB variant or that elusive 64 GB version. Just the 32 GB version. For many of us we thought that marked the beginning of the end for the 16 GB storage option since many a times it is usually very scanty. With the likes of Samsung and others busy adding feature after feature to make their devices stand out this has the effect of increasing the size of the firmware hence leading to the operating system taking up more of the space that ought to have been left for the user. In the end, in a 16 GB device you are left with say 9 GB user space. That was the case with devices like the Galaxy S4. Since the 8 GB storage option for high end smartphones went on to die a natural death after the Nexus 4, I thought the same would happen to the 16 GB storage option. Apparently not. Samsung stuck with 16 GB for its Galaxy S5 and it will likely do the same with the Galaxy Note 4 if the above image is anything to go by. I can try to understand what informs that decision. Unlike last year when you could expand your external storage via a microSD card to just 64 GB, it is now possible to expand external storage upto 128 GB. The Galaxy Note 4 is expected to pack many latest specs and other than the 16 GB internal storage the device will likely have a 2560 x 1440 pixel display, 3 GB RAM, an octa-core Exynos 5433 backed by a Mali-T760 GPU in some regions and a Snapdragon 805 processor with an Adreno 420 GPU in others and of course a 16 megapixel camera. The Exynos chip will be 64-bit. 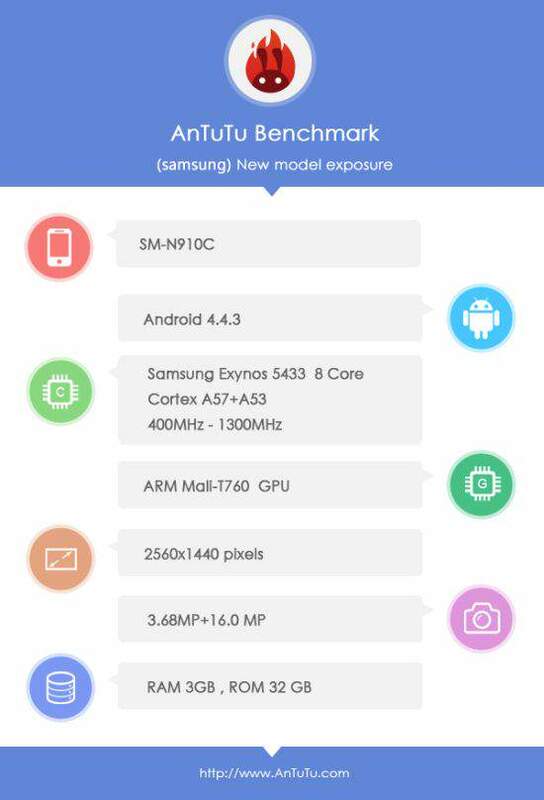 Here is an image of alleged Antutu benchmark scores of some variants of the SM-N910.